Looming over Tinseltown the iconic sign — which has drawn untold number of Hollywood wannabes — started its life as a real estate promotion. Los Angeles Times publisher Harry Chandler erected it as an advertisement for his Deluxe Beachwood Canyon subdivision in 1923. 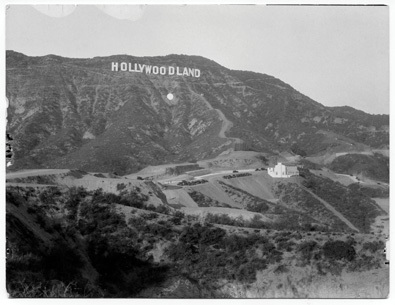 At a cost of $21,000, it joined numerous other large-scale real estate signs spread along the hills of Hollywood. Originally installed with 4,000 light bulbs, the sign lit sequentially followed by the blinking of a large white dot just below the 50-foot steel letters. In one of its more famous episodes, the sign provided the suicide platform for aspiring starlet Peg Entwistle’s 1932 jump into oblivion. Intended to last only a few years, official upkeep of the sign was abandoned in 1939 and benign neglect set in. Added was a blackout edict at the advent of World War II and the sign went dark. By 1949 the sign was collapsing. The Hollywood Chamber of Commerce came to the rescue and fixed the eyesore, eliminating the L-A-N-D portion but it declined to relight the restored letters due to the high cost. The remaining sign became a PR dream. Though declared a landmark by the city of Los Angeles in 1973, the sign continued to be ignored and slowly disintegrated. In 1978 the sign was replaced with a new structure subsidized by 13 donors, who pledged $27,000 apiece. As a symbol of the good, the bad and the ugly it remains on the face of Mount Lee, summoning the innocents like moths to a flame.